Anglers use guides for different reasons; some have never fly fished before, some just enjoy fishing with a guide, and others use a guide to get to know a fishery. 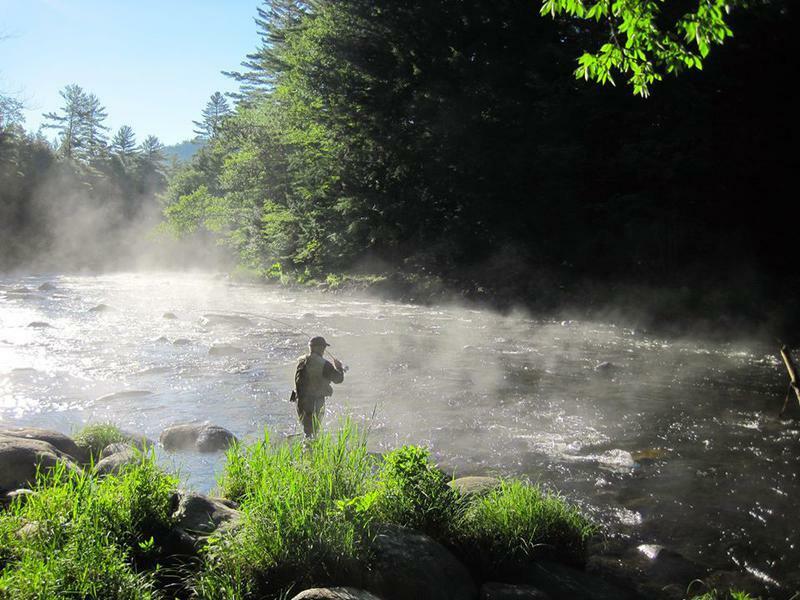 If you are coming to the legendary West Branch AuSable River for the first time, it may be helpful to utilize one of our experienced local fishing guides. They have the skill and knowledge to help you get started, grow your skill, catch fish and enhance your overall experience. Advanced anglers not familiar with the West Branch AuSable River watershed will also benefit by being introduced to some of the best spots, the right flies, and unique techniques. Our experienced local guides will enhance your objective to hook fish. 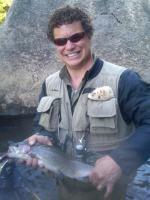 * Full day on the river 1 angler 8 hrs- $285.00. 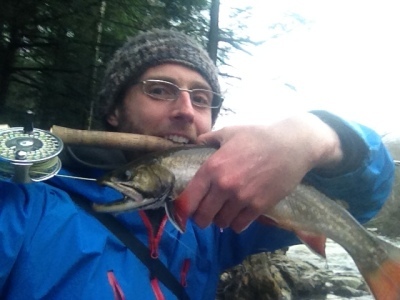 New York State valid fishing license , lunch , and gratuity for the guides. Rental gear is available. Although we do have a price for a third angler, we do not recommend it, but we can occasionally accommodate 3 anglers. We don't like fishing 3 anglers to a guide on wade trips, as there is simply no way that the guide can give 3 different anglers enough time to guarantee a positive full experience for all. If everyone in the group is an experienced angler, it may work. But it is not a good idea for 3 novice anglers if you are looking to gain skill set. Our river of focus is the West Branch of the AuSable River. However, we do utilize other rivers and streams in the area based on river conditions and special requests. We are flexible to your needs and will customize a trip just for you. We practice catch-and-release on all our guided trips. Together, we can preserve and enhance our valuable fishing resources. Our fishing season begins April 1 and runs through October 15. We fish the waters that are fishing best at the time of your trip. 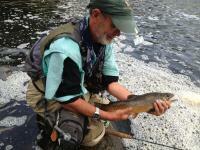 The West Branch AuSable River is our main fishery and is a fabulous river for all skill levels. Payment Policy: We will hold your reservation with your credit card, but no charges will be made until the day of your trip. Trips canceled more than seventy-two hours in advance will not forfeit any deposit. Trips canceled less than seventy-two hours in advance will forfeit 50% of the trip fee unless we are able to re-book the trip, then there will be no penalty. 100% charge for a no show the day of the trip. No penalty is forfeited for any trip canceled due to a serious threat of inclement weather on the day of the trip. Call 518-946-3474 or use our online request form . Offered trips: West Branch of the AuSable River, Saranac River, Bouquet River, Salmon River, Chateauguay River. This is a no-brainer because the better you can cast, the more likely you can put the fly where the guide suggests you put it. The three most important things that would make any guide trip on any waterway better would be casting, casting, and casting. The toughest thing to hear before any day of guiding begins is “It has been a couple of years since I have picked up one of these" while the client vaguely wiggles the fly rod. . . . All of the flies tied and articles read will never help as much as an hour spent airing out the line and throwing some yarn around at plates or hoops on the lawn. Taking the time to do this also illuminates the condition of the line and equipment a bit better than a hazy remembrance of how the tackle worked the last time out. Fishing guides can not read you mind always, and they deal with many different ability levels of clients over the course of a season. 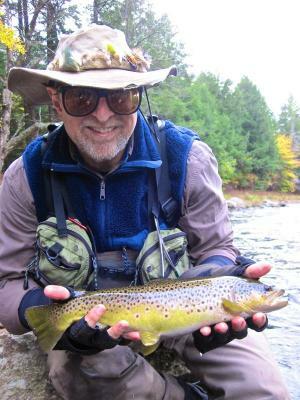 Bozeman-based Brian Grossenbacher notes "Any information the client can provide is invaluable in creating a more personal and enjoyable fishing experience. It is their trip after all, not mine. Is it important to catch lots of fish? Big fish? Lots of big fish? Do they prefer fishing dries? Streamers? Do they have any physical limitations? Do they consider themselves to be a beginner, intermediate, or expert angler? Do they prefer wade fishing or fishing from a boat?" Check the weather before you arrive and make sure you’ve got all the rain gear and outerwear you may need. Once out, there may be no going back. Sunblock is a must, no matter where or when you fish and remember the importance of hydration. Pack drinks and food.